The bodies of cars come in a variety of types – sedans, hatchbacks, station wagons and so on. 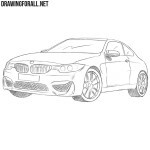 In this drawing lesson, we’ll show you how to draw a coupe car. 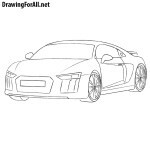 In our tutorial we draw an Audi, but you can draw an other car, using tips from this drawing tutorial. 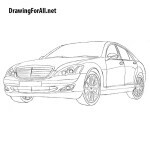 So, take a pencil in your hand and with light movements of your hand, sketch out the outlines of the car’s body. Now sketch out the characteristic grille of the radiator and the outlines of the Audi headlamps. Next, draw the outlines of the wheels and rear-view mirrors. And now, using clear and dark lines (or using a liner), carefully draw out the outline of the front of the car. Now let’s move to the top and draw out a roof, outlines of windows and mirrors. Recall that we are drawing a coupe car, this means that the car has one door on each side, and hence one window on each side. Now go down a bit and draw out a single door. In fact, having only two doors is the only difference between a coupe and any other cars. Now we will need to draw wheels and wheel arches. Try to be the most accurate when you draw these parts of the car. 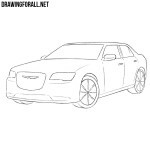 Draw out the outlines of the wheel rims (either as in our example or by creating your own design). Next, using dense hatching draw shadows. If at the end of the lesson on how to draw a coupe car your drawing became similar to ours, then you did everything right. But even if you made any mistakes, do not despair, just go back to the failed steps and repeat them. 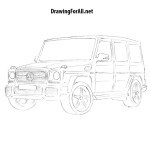 Once again we recall that the only difference between the coupe and other types of cars is the presence of only two doors, so use this lesson in order to draw your favorite car. 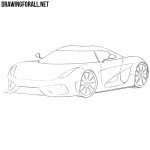 Also go to the category “Cars” on our site, there you will find a lot of interesting drawing lessons about cars.